Using tear gas and water cannons, the Malaysian police on November 11 tried to stop at least 30,000 people from reaching Merdeka Square in the Malaysian capital of Kuala Lumpur. But the aim of the Bersih (clean) protest movement was to hand a memorandum, calling for election reform, to the Malaysian king. As political commentator Raja Petra Kamarudin says, to this end, the movement achieved its objective. Read my lips, S-L-O-W-L-Y this time. It was NOT a demonstration. It was not even a protest. It was a march to hand a Memorandum to His Majesty The Agong [Ed: The Malaysian king]. Prior to that, a letter was handed to The Agong to inform His Majesty that a group of 100,000 citizens was requesting an audience to hand over this Memorandum. The Agong responded by asking that another official letter be submitted listing down the names of the half a dozen or so representatives who would be going into the palace to deliver the Memorandum on behalf of the 100,000 citizens. This was complied with on the Friday before that. For all intents and purposes, the Agong did not say no to the request for an audience. He just wanted to know who would be those representatives of the 100,000 citizens; citizens of the Agong. And in accordance to His Majestys wishes, the names were officially delivered by way of letter the day before. Of course, the Agong would not be in the palace that Saturday. Even before the November 10 march everyone knew that His Majesty would be gracing the Monsoon Cup in Terengganu. This is an annual affair and the date of the Monsoon Cup had been fixed way before the November 10 march was even mooted. But no one expected The Agong to personally receive the Memorandum. After all this is not proper protocol. Proper protocol would be to hand the Memorandum to a palace official nominated by His Majesty to receive it on behalf of His Majesty. The Agong does not even personally make official announcements, though these announcements may be on behalf of the government. The official announcements are always done by the Keeper of the Royal Seal. Such is the proper protocol and it was expected that proper protocol would be observed in this instant as well. But this did not stop the government-owned media from spinning the story that The Agong was not in the palace but in Terengganu that day. They tried to paint the scenario that this was abnormal and reflects the failure of [protest movement] Bersihs official delegation in meeting the Agong in person to hand the Memorandum to His Majesty. Such a thing would not be proper and no way would Bersih expect the Agong to do what is not proper. The dignity of the institution of the Monarchy needs to be protected and just because Bersih wanted to hand a Memorandum to the Agong does not mean that His Majesty needs to push aside protocol and forsake the dignity of the institution of the Monarchy. The Inspector General of Police proudly announced to the world that the police succeeded in frustrating the move by the marchers to assemble at the Dataran Merdeka [Merdeka Square]. They failed in their objective, boasted the IGP. The police won, the people lost. As they say, those who forget history are doomed to repeat its mistakes. You ignore history at your own peril. Hitler learned this the hard way. The beginning of the end for Napoleon was when he opened two battle fronts by engaging Russia. Hitler did the same and suffered Napoleons fate. Then, Hitler wrongly guessed where the Invasion of Normandy would take place just like the British before that in Singapore. The Allied forces landed in the least expected place and from there on it was plain sailing all the way to Berlin. Saddam too made the same mistake. He thought that the Allied forces would land in Kuwait and he sent his entire army to laze on the beach while waiting for the Americans and their buddies to sail straight into deaths door. Saddam cannot be blamed for thinking so because for weeks before the Iraqi invasion CNN had showed live footages of the Allied forces rehearsing the Kuwait invasion which involved landing craft from ship to shore. Saddam should have remembered what happened to the British in Singapore. But he did not. How could he when for weeks CNN had showed scenes of the Allied forces training for an invasion by sea? Instead, the Allied forces parachuted into Iraq and caught the Iraqis completely by surprise. The Iraqi army was dissected into two and the South could not help those few trapped in the North. Iraq fell before you could finish screaming Oil for Food Scandal. The plan was to deliver a Memorandum to the Agong. It was not to invade Dataran Merdeka. It was not to battle the police. It was to march to the Istana Negara to deliver a Memorandum. And that was achieved. Yes, greater men than [Malaysian prime minister] Abdullah Ahmad Badawi had been tricked and their armies massacred as they looked the other way. So Abdullah should not take it too hard or too personal. After all, Hitler and Saddam are certainly larger people than any Malaysian Prime Minister. And if they too could swallow a Red Herring - hook, line and sinker - can we blame Abdullah who is not even a fraction of these two? No, in spite of the IGPs happy rhetoric and boastful statement that the police won and the marchers lost, the opposite actually holds true. The organisers never intended to converge onto Dataran Merdeka. This was a mere Red Herring. Of course, the hype over the months leading to the march gave the impression that there was going to be a gathering at Dataran Merdeka. And it was going to be at 3 pm on Saturday, November 10, 2007. Even the party leaders were made to believe so and all and sundry were geared towards this gathering at Dataran Merdeka. The organisers even applied for a police permit to hold this gathering, which was of course rejected. And the organisers continued announcing that the 3 pm gathering at Dataran Merdeka would not be aborted in spite of the rejection of the police permit. And the reason the police rejected the application for the permit, other than for so-called security reasons, is that because the organisers had not obtained permission from City Hall to use Dataran Merdeka for the gathering. The whole country was made to believe that an illegal gathering would be held at Dataran Merdeka. Even the top echelons of the political parties thought so, as did the government and the police. But only a handful of the planners knew what the real game plan was. Not even the committee members or the field commanders were privy to the details. They were only told that Plan A was to gather at the Dataran Merdeka. But there would be three other plans; Plan B, Plan C and Plan D. So wait for Saturday morning and they would be told whether it would be Plan A, Plan B, Plan C, or Plan D.
But there was no Plan A. There was also no Plan B, Plan C or Plan D. There was only one plan, to march to the Istana Negara [king's palace]. 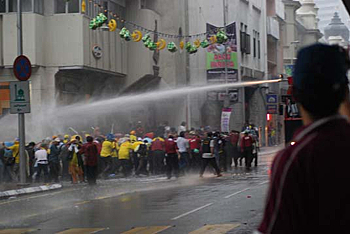 And to be able to do this the police needed to be sent to Dataran Merdeka. And they went there. And they guarded an empty padang [field] which was deserted except for the occasional swallow that landed to look for a stray worm. And while the police idled away in the hot sun followed by soaking rain, the field commanders were told to pass word to their group that the assembly points had been changed. Abandon Dataran Merdeka. Instead, head for the five designated assembly points. Thousands of SMSess floated in the air that Saturday morning. A chain reaction was triggered that sent everyone aiming for the new meeting points. They were told they should assemble at these new points and from there crash into Dataran Merdeka by force. 4,000 police, however well-armed they may be, are no match for 50,000 marchers. But would they invade Dataran Merdeka with children, women, one-legged men on crutches, those in wheelchairs, old men, and so on, in their midst? No, the plan was to march to the Istana Negara. That was the only plan. And the march would be a breeze with no obstacles to hinder them considering all the police were vigilantly guarding the extremely deserted Dataran Merdeka. Yes, that was the plan. The plan was to deliver a Memorandum to the Agong. It was not to invade Dataran Merdeka. It was not to battle the police. It was not to put the children, women, one-legged men on crutches, those in wheelchairs, old men, and so on, at risk. It was to march to the Istana Negara to deliver a Memorandum. And that was achieved. Yes, it is true that the entire Kelang Valley was paralysed that day. But it was not paralysed because of the march. It was paralysed because the police had sealed all the roads leading into Kuala Lumpur. 50,000 marchers were caught in this jam. 50,000 marchers could not get into Kuala Lumpur. So it became a march of 50,000 instead of 100,000. But whether it was 50,000 or 100,000 what does it matter? The Memorandum to the Agong reached the Istana Negara nevertheless, even with a mere 50,000 marchers. And that was what we wanted and that was what happened. We will talk more about the November 10, 2007 march in the next episode. Yes, there is more to talk about. We need to talk about the allegation that this was an opposition event, we need to talk about the allegation that the Monarchy is being dragged into politics, we need to talk about what we hope to achieve with all this, we need to talk about what comes next, and much more. In the meantime, let us sit back and gloat about how the Royal Malaysian Police was sent to guard an empty field the whole day long while we casually strolled to the Istana Negara for our appointment with the Agong. Oh, and before I sign off, Saturday is wear yellow day. Wear anything yellow every Saturday whether it is a shirt, T-shirt, scarf, tudung, baseball cap, ribbon on your lapel, wrist band, etc. Just make sure it is yellow. Note: The above article was posted on www.malaysia-today.net (Your source of independent news). Raja Petra Kamarudin started the Malaysia Today website and his blog to facilitate open discussion on Malaysia's political and social scenes. Known for his hard-hitting commentaries, which are often infused with humour, Raja Petra is also the author of When Time Stood Still and From Prince To Prisoner. Malaysians were urged to wear yellow every Saturday in a protest against the government, after a rally calling for election reform was suppressed with water cannons and tear gas, an AFP report said. The organisers of last Saturday's rally, which despite heavy rain and a government ban drew 40,000 people in the biggest turnout in a decade, selected yellow as the colour of "people power". "We are asking everyone nationwide to wear yellow on every Saturday. It can be a yellow cap, a yellow shirt, a yellow ribbon... just anything yellow," said Syed Azman Syed Nawawi from the opposition Islamic party PAS. The protest movement, a coalition of opposition parties and civil society groups known as Bersih [Ed: Malay word for "clean"], is pushing for reforms including a clean-up of the electoral roll and an end to postal votes. They handed a protest memorandum to the king during the rally and said Tuesday they would also meet the country's nine state sultans to press for reforms. Prime Minister Abdullah Ahmad Badawi, who is expected to call snap polls early next year, has denounced the protesters for involving the king who is highly respected but has a largely ceremonial role and usually stays out of politics. "We do not want to drag in the king and the sultans but who else can we appeal to," Syed Azman said at a press conference along with other opposition leaders. "The government and the election commission have turned a deaf ear. So we turn to the king who is the protector of the people and the constitution," he said. The AFP report also said that four Bersih leaders have been summoned to report to the police headquarters on November 15. Police have said that 245 people were detained during the protests, although organisers and rights groups say that is an exaggeration and only 36 people were arrested. Reports said today that the parents of 18 children detained at the rally will be charged with engdangering their children. "It was an irresponsible act and wrong of the adults to bring children to the rally," police chief Musa Hassan said according to the New Straits Times.